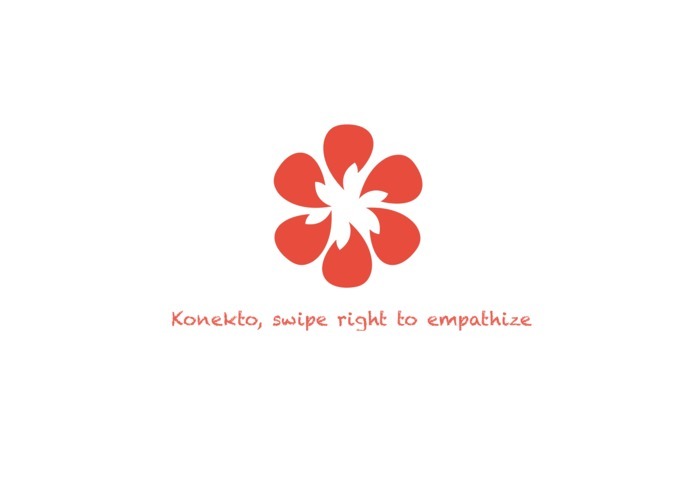 Konekto is an app that allows people to connect with anonymous story sharing within the friend circle. Radical transitions in the college years can lead to various stresses, ranging from concerns about grades to struggles for independence. Past studies reported that 53.8% college students reported that they had felt more than average or tremendous stress within the last 12 months. Even though social connection is shown to be one of the most effective ways to reduce stress, 50.1% students frequently or occasionally felt isolated from campus life. How might we improve mental wellbeing of college students by fostering deeper connection between them? 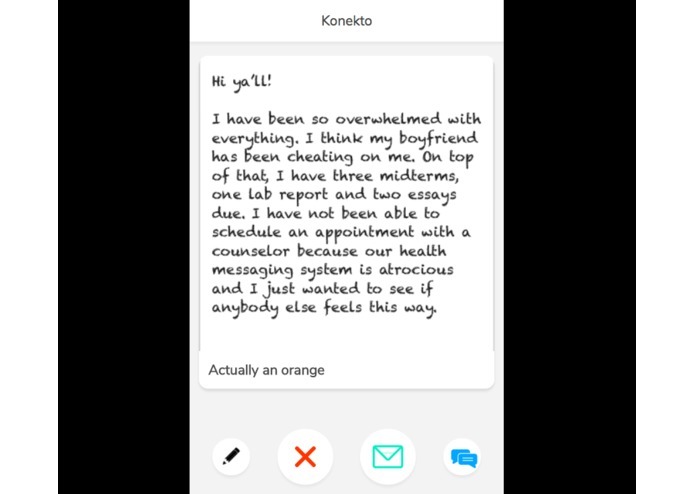 Konekto fosters mental wellbeing of college students through anonymous story-sharing with friends. Users sign up with their Facebook account, and after they log in, they can see anonymous stories from their Facebook friends. If a story resonates with them, they can choose to swipe right to connect via private chat. Students can not only feel safe to share what's really going on in their lives, but also realize that they are not the only one going through difficult times. 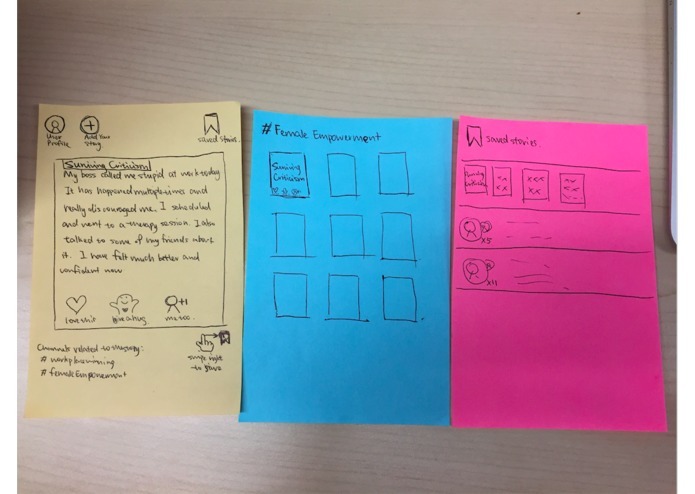 We spent most of the time brainstorming and user testing during the hackathon, and we were able to come with a prototype for our essential "swipe left/right" flow. The functioning MVP is currently still being developed. It is a progressive web app built with react.js and firebase. After talking to several mental health mentors, we realized that a big challenge is to prevent bullying on the app. We came up with several options to prevent bullying, such as having a flag button. We spent some time making sure we’re solving a real need by testing our assumptions. 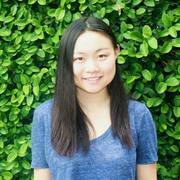 We started by listing our assumptions for the idea, and here are our top two assumptions: (1) college students are interested in reading anonymous stories from their friends, and (2) college students are more willing to share personal stories anonymously (vs. not anonymously) with friends. To test those assumptions, we first asked 18 students on a scale of 1-5, how interested they are in reading anonymous stories from their friends, and more than 80% of them gave a score of 3-5. We then asked them to think about a personal story that they haven’t shared with their friends. 94% (vs. 78%) of them are willing to share personal stories anonymously (vs. not anonymously) with friends. We are going to finish the MVP by next week, and start testing on 3 college campuses: Stanford, UC Berkeley, UC Davis. We will start onboarding students from dorms and student organizations, and iterate on the app based on the feedback we receive from students.